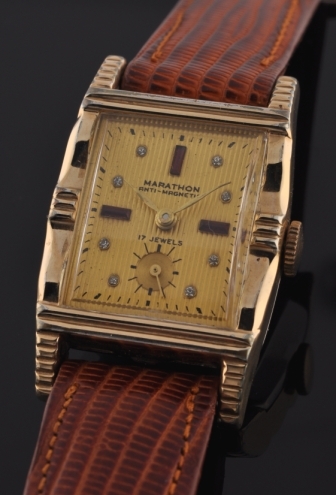 Here is a vintage 1950’s Marathon vintage watch measuring 25.5x38mm. in a ridged, decorative case with ribbed original jewel encrusted dial. This is a men’s watch, but is perfect for a woman as well. The manual winding movement was just cleaned and is accurate. The case is in great shape. Only in my close-up pictures does any case wear appear. In real life, the case appears pristine with the naked eye.